I believe in the healing and transformational power of visual art + sound + meditation on an individual and a social level. Our society is experiencing digital overload; we have become addicted to our digital devices. Capturing moments on our iPhones and posting them on social media to earn “likes” has trumped the actual experiencing of life. Social behavior has become egocentric with more value being given to virtual popularity, than personal reflection. As a community, we crave authenticity and self-awareness. But how can we overcome our digital overload? 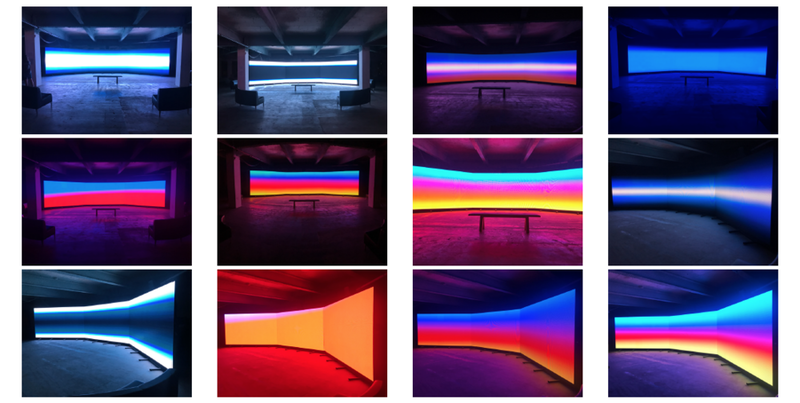 8x8 is a light and sound video installation that creates a meditative space for the viewer. I produced 8 artworks in slow animation sequence for 8 minutes each sequence. I collaborated with sound healing artist Tenille Bentley, who has composed healing frequency music in correlation with the energy and visuals of my visuals. This immersive experience has a profound effect of calm, well being and meditativeness. Japanese Buddhist monks built Zen gardens over 1200 years ago to create a communal space that visually imparts a sense of meditativeness and mindfulness. In 2016, our communities need public art spaces that will do the same thing; spaces that allow people to decompress from the stresses of everyday life using the digital language of our times.